Go to original pattern for design DROPS 104-25. 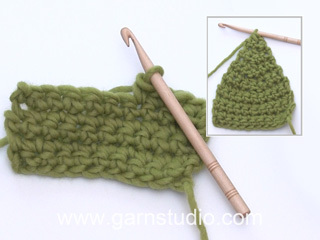 DROPS crochet hook size 6 mm [US J/10] – or the crochet hook size needed to obtain correct crochet gauge. Crochet info: Substitute first hdc at beginning of row with 2 ch. 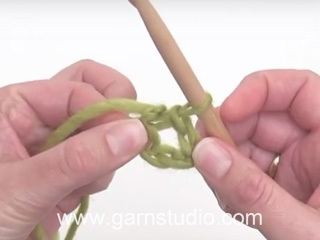 1 Half double crochet (hdc): YO around crochet hook, put crochet hook through sts under and gather thread. YO around crochet hook and pull through 3 sts on hook. Crochet 1 hdc, but wait pulling through (= 3 sts on crochet hook), then crochet next hdc but when last pull through is made, pull yarn through all sts on crochet hook – now 1 hdc sts is decreased. Hat: Crochet hat from top down. 1st round: Crochet 3 ch with crochet hook size 6 mm [US J/10] and 1 thread of each color (= 2 threads ) Silke-Alpaca, crochet 9 hdc in 1st ch = 10 hdc. 2nd round: Read Crochet tip! 2 hdc on each hdc = 20 hdc. 3rd round: * 1 hdc in first hdc, 2 hdc in next hdc * repeat from *-* = 30 hdc. 4th round: * 1 hdc in each of first 2 hdc, 2 hdc in next hdc * repeat from *-* = 40 hdc. 5th round: * 1 hdc in each of first 3 hdc, 2 hdc in next hdc * repeat from *-* = 50 hdc. 6th round: Crochet 1 hdc on each hdc but inc 5 hdc evenly = 55 hdc. (For size L repeat 6th round = 60 hdc). 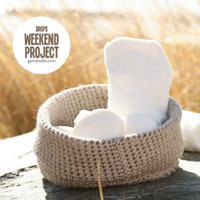 Continue to crochet 1 hdc in each hdc until piece measures approx 18-20 cm [7”-8”]. 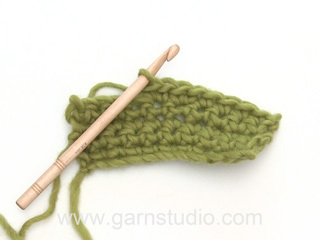 Ear flaps: Start crocheting approx 5 cm [2’’] from mid back. Crochet on crochet hook size 6 mm [US J/10] with 1 thread of each color (= 2 threads) 12 hdc along bottom edge of hat. 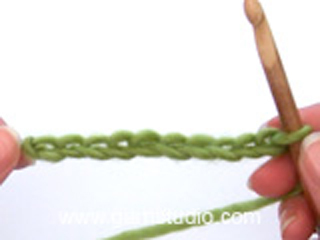 Then crochet back and forth at the same time as dec 1 hdc at beginning and end of each row – read Decreasing tips. Repeat decrease until 6 hdc are left. Now 4 rows has been crochet in total. Repeat on other side. 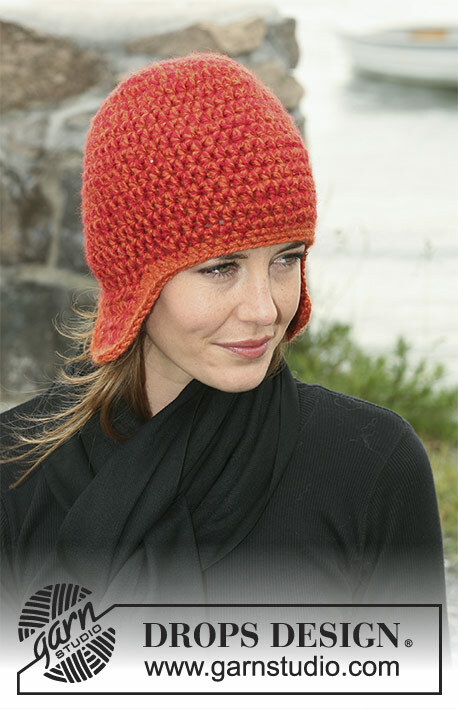 Edge: Crochet on hook size 6 mm [US J/10] with 2 threads orange around hat at bottom edge and around ear flaps as follows: Start in seam mid back, 1 sc in sts. Continue to crochet 1 sc in each st, but crochet 2 sc in outermost corner on ear flaps, finish with 1 sl st in 1st sl st at beg of round. Crochet round with 1 sc in each sc. Cut thread and sew. 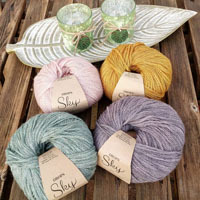 Liebes Drops Team, ich möchte diese Mütze mit Brushed Alpaca Silk häkeln. Benötige ich dann 150 Gramm der Farbe 1 und 100 Gramm der Farbe 2 oder wieviel von jeder Farbe? Vielen Dank schonmal für die Antwort! Liebe Bettina, DROPS Nepal würde eine beste Garnalternativ (siehe hier) - Mehr Informationen über Garnalternativ finden Sie hier. Viel spaß beim häkeln! Habe diese Mütze gehäkelt, bei der deutschen Anleitung wird nicht angegeben ob diese rundgehäkelt oder hinten zusammengenäht wird. Habe sie rundgehäkelt und die hintere Naht wurde nicht gerade. Ausserdem fehlt bei der Angabe Ohrenklappen di cm Angabe für die hintere Mitte. Hei, må øreklaffene hekles etter at luen er ferdig? Er nybegynner. Hei Carla. Ja, det gör du. Luen hekles fra toppen og nedover, saa du slutter af med klaffene. Do you have or know where I can find a crochet pattern for a child's earflap chetah hat?? Dear Mrs Wojtowicz, you may have a try with a pattern of leopard spots (DROPS Extra 0-401) and one of our Monster hats. Happy crocheting! Denne vil jeg også ha. SUPER ! Denne vil jeg gjerne hekle!